If asked to make a list of strategies to mitigate climate change, you would probably think of options like solar power, energy efficient appliances, sustainable forestry, or perhaps, landfill methane capture or switching to non-fluorinated refrigerants. Chances are, though, you would not include “seaweed in cattle feed” on your list. Yet, new and ongoing research by Ermias Kebreab from UC Davis indicates that adding small amounts of the seaweed species Asparagopsis armata to cattle feed can reduce enteric fermentation in cattle by 30%. This innovation, along with related scientific discoveries, could lead to new practical mitigation options if accelerated by the right policies. As you probably know, alongside carbon dioxide emissions from fossil energy, non-CO2 emissions are also major contributors to climate change. Numerous studies have shown that many of these non-CO2 sources are “low-hanging fruit” (i.e., cost-effective mitigation options). Case in point is many agricultural sources. Emissions from animal husbandry, in particular, are expected to grow as countries develop and acquire new tastes for higher-emission animal products (e.g., beef). Together, dairy and beef cattle are responsible for 8.8% of global emissions. These emissions arise from several categories: enteric fermentation, manure management, land-use change for cattle pasture, feed agriculture and processing, and farm operations emissions, among others. Enteric fermentation, 39% of total emissions in the livestock sector, occurs during the digestive process. Methanogen bacteria in the animal’s rumen produces methane as a biproduct of incomplete digestion, which is then mostly belched out by the cow. GHGMI focused on enteric fermentation in drafting the agriculture sector guidance for the ICAT initiative. There we examined mitigation options feasible within the economic, technological, and policy constraints of developing countries. There are two types of interventions to reduce enteric fermentation emissions: (1) limit the number of cows, or (2) reduce the methane emitted per cow. The first option is most realistically achieved by increasing the productivity (meat or dairy) per cow and by convincing consumers to reduce their demand for beef and dairy. The second option, lowering the enteric fermentation emission factor (methane emissions per cow), can be achieved through feed improvements and additives, genetics, rumen bacterial modification, and animal health interventions. Advanced feed additives have begun to show greater promise in recent years. As a baseline mitigation option, the addition of oils and fats has been shown to reduce methane production by 18% in cattle. The synthetic additive 3-nitrooxypropanol (3NOP) made a splash in 2015. A Penn State study demonstrated a 30% reduction in methane from dairy cattle. If manufacturers can demonstrate its safety, 3NOP may see widespread adoption in developed countries. Synthetic feed additives like 3NOP are promising but are highly expensive and technologically demanding to implement, potentially limiting wider dissemination. A paper by Professor Moraes at UC Davis (2015) proposed a model to weigh the costs of dietary manipulation as a mitigation strategy. In their model, even the lowest cost enteric fermentation mitigation scenario had a cost of US$127 per metric ton of CO2e reduced when applied to California dairy cows. Compare this with a mitigation cost curve analysis by McKinsey & Company, which excluded any options over US$80 per ton, and you can begin to understand why dietary supplements have not often been seen as a scalable mitigation option. Recently, however, there are promising scientific advancements in comparatively “low-tech” dietary supplements. The best publicized discovery is from the Kebreab lab at UC Davis, using Asparagopsis armata, a close relative of the red seaweed garnish in the Hawaiian dish poke, Asparagopsis taxiformis. In vitro (tissue sample) studies have shown that enteric fermentation emissions could be reduced by as much as 99% using A. taxiformis. In the first methane experiment testing the Asparagospsis genus with live cattle, the Kebreab lab found that adding 1% A. armata to the feed reduced enteric fermentation emissions by 30%, the same as 3NOP. Other experiments in Mexico show promise using terrestrial plants such as the cosmos flower and leucaena leaves. Results of the Kabreab experiment are still early and far from conclusive. Still, the case of the genus Asparagopsis is exciting as part of the global “bloom” of industrial seaweed innovations. It joins other algaes as a “green” solution to other challenges such as non-fossil fuels (algal ethanol), materials (bioplastics), and nutrition (e.g., spirulina). A growing seaweed farming sector could be provide numerous low cost sustainable development benefits in the form of new local employment along with nursery habitat for fish. Unlike synthetic feed additives, which are subject to intellectual property rights, plant-derived additive technologies will hopefully be open source, accelerating dissemination into the developing world. Larger-scale studies will need to demonstrate that there are no negative consequences for bovine production levels, product quality, food safety, or long-term health. If this red alga gets the “green light,” incorporation into cattle feed could allow immediate emissions reductions, as additives begin having an effect shortly after feeding. The two main barriers would be (1) cultivating enough of the seaweed and (2) dissemination of seaweed into cattle feed. Asparagospsis armata has already been cultivated for commercial uses. Owing to the popularity of the dish poke, there is already strong demand for Asparagopsis taxiformis cultivation, as well. Both species, however, have invasive characteristics, which is an important risk to manage where cultivation occurs to minimize damage to marine ecosystems. Cultivation, in some places, may also offer an opporutntiy to restore heavily damaged coastal marine areas. Ensuring farmers actually use the seaweed is another challenge. How can governments encourage use of seaweed as a feed additive, given that it does not seem to increase a farmer’s bottom line through production improvements? “Green” dairy or beef certification programs could drive adoption and generate a premium price to early adoption farmers using low-methane feed. Where relevant, governments can incentivize the practice by including the seaweed in feed sold by agricultural extension programs. Approving feed supplements as an offset project methodology may cover the costs and create opportunities for additional private sector involvement. Or, as in California, governments can require farmers to comply with emission efficiency caps, and present seaweed additives as a low-cost option. Just as “green infrastructure” (trees on riverbanks) may limit erosion or provide water purification services more cost-effectively than “grey infrastructure” (water treatment and filtration facilities), there may be botanical compounds that reduce ruminant methane as effectively as synthesized chemicals. Practical feasibility needs to be demonstrated before Asparagopsis seaweeds can be scaled for mitigation. However, these species are one unexpected discovery that has potential as a significant mitigation technology. If all cattle were fed Asparagopsis taxiformis tomorrow, this could reduce global greenhouse gas emissions from all sources by a full percentage point. The Asparagopsis seaweeds are just one of many small breakthrough technologies that can easily go unnoticed, but that, in combination with other “under the radar” discoveries, gives us a reason to be optimistic. Lucas, P. L., D. P. van Vuuren, et al. (2006). “Long-term reduction potential of non-CO2 greenhouse gases.” Environmental Science & Policy 10(2): 85-103. Livestock sector: 14.5% anthropogenic GHG emissions. 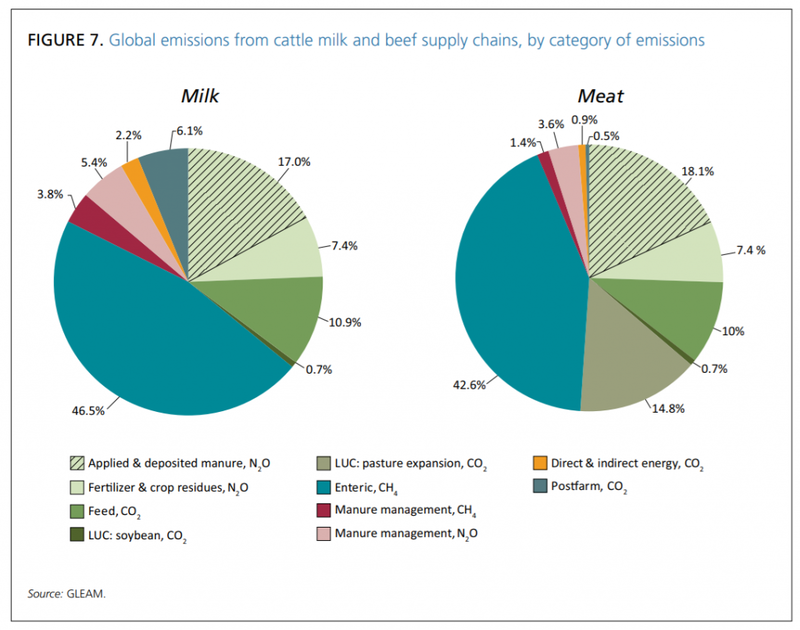 Within livestock sector, beef is 41% of emissions, cattle dairy is 20% of emissions. The FAO analysis excludes emissions from cattle manure. Enteric fermentation: Occurs as a biproduct of incomplete feed digestion. Manure management: Methane from anaerobic decomposition of organic compounds (particularly when managed as a liquid), direct nitrous oxide emissions, and indirect nitrous oxide emissions (from ammonia that is transformed to nitrous oxide in the atmosphere). Land-use change for cattle pasture: Carbon dioxide emissions from land-use change, particularly deforestation, caused by the expansion of cattle pasture. Feed agriculture and processing: The emissions used to grow the crops for livestock feed, including fertilizer emissions, land-use change emissions, and other farm emissions. Also includes the transportation, electrical, and other emissions to process commodities into cattle feed. Farm operations: In particular, the stationary (natural gas for heat), purchased (most electricity), and mobile (vehicle fuel) combustion emissions used as a part of farm operations. Contrary to popular imagination, enteric fermentation emissions are about 95% from cows belching, not flatulence. 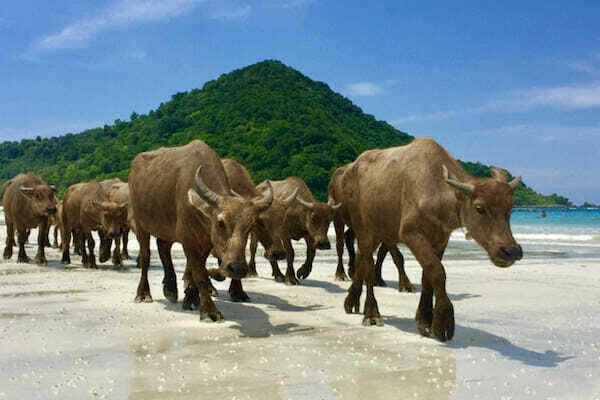 To read more about these see: https://globalresearchalliance.org/wp-content/uploads/2014/12/LRG-SAI-Livestock-Mitigation_web2.pdf. Wired has a good popular science article on a large-scale genetics project in Canada, breeding cows for reducing methane emissions: https://www.wired.com/story/canada-is-using-genetics-to-make-cows-less-gassy/. Note: Though challenging in some country contexts, 3NOP is a fascinating case as it shows a production efficiency increase of up to 80%, which could make it financially viable for farmers with sufficient capital. Kraan, S., & Barrington, K. A. (2005). Commercial farming of Asparagopsis armata (Bonnemaisoniceae, Rhodophyta) in Ireland, maintenance of an introduced species?. Journal of Applied Phycology, 17(2), 103-110. Back-of-the-envelope calculation. Dairy and beer sector comprises 8.8% of global GHG emissions, as noted above. According to FAO report, enteric fermentation is 46.5% of dairy emissions and 42.6% of meat emissions globally. Initial studies show a 30% reduction from the use of Asparagopsis taxiformis, as noted above. Using the lower of the two numbers: 8.8% * 42.6% * 30% = 1.12%.